Jansen will play C here. The writing is on the wall for Sweezy. 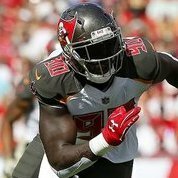 Once Licht drafts a LG within the first 3 rounds he will be shown the door. At the same time I can see him being benched and riding the pine as a 6th OL. Which is a lot of money for a back up. We paid Evan Smith like $4M to be a backup. So we don't seem to care that much. Well I guess that's that... I'll be watching 32 reg season Bucs games this year. Two games a week, one normal game day and the second is to strictly watch Jensen do his thing. He puts a lot of guys on their butts. He gets to the second level really well. He makes reach blocks look really easy. He blocks defensive linemen a gap or two over and STILL gets to the side he needs and turns guys away from the play. LBs too. I know it was a highlight reel, so we didn't see any of his goofs and missed blocks. But Jensen is immediately one of the better linemen we've had recently.